When we first made the decision to move to Big Canoe as full time residents, our son had only one major concern. How would he be able to fill his jack-o-lantern full of candy during Halloween? This could be a deal-breaker for a 9 year-old! 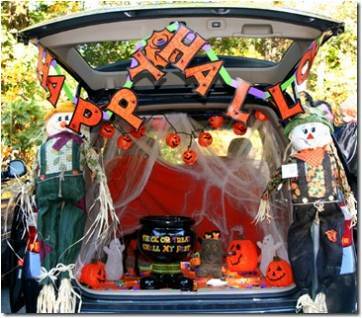 Fear not young ghosts and goblins, Big Canoe has a great tradition called Trunk or Treat. On Saturday, October 31st at 5:30 p.m., cars will line the Wildcat Soccer Field parked in rows for the kids to roam the aisles and pick their favorite sugary filled treats. But, there may be some tricks involved since the parents are encouraged to decorate their trunks in the spirit of Halloween. This is a great event for the entire family as there will be games, hayrides, a photo booth, and of course a haunted house if you dare. The parents can relax and have some fun as well since this is in a safe, controlled environment so the kids can run around and be kids. Our son now looks forward to this awesome event that the POA and Canoe Cubs sponsor every year. Another great advantage to living in Big Canoe!